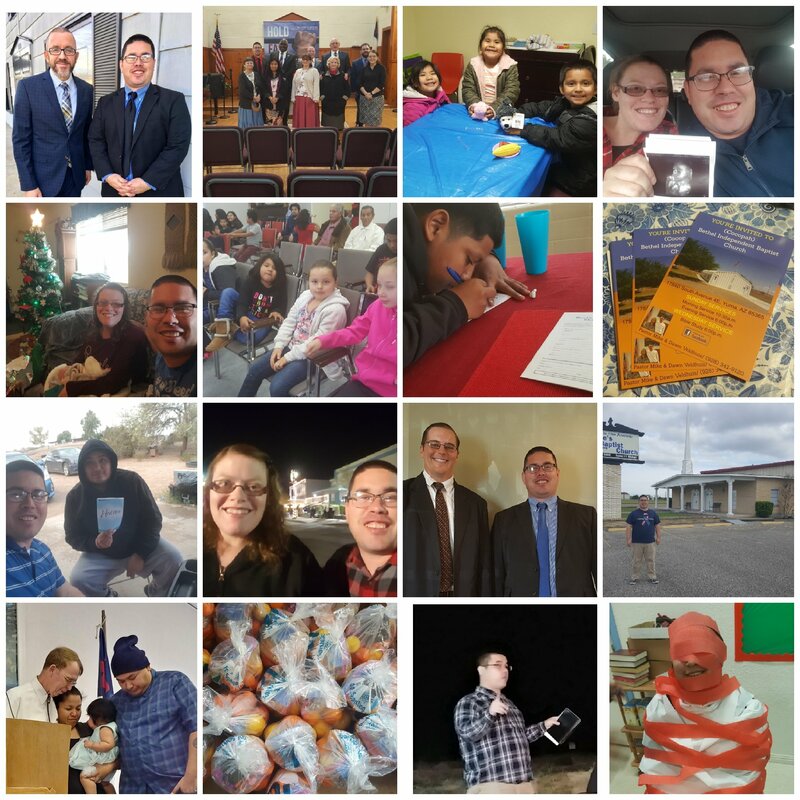 During the month of November, Jacob flew to Texas to present at 5 churches in southern Texas. He spent 2 and a half weeks staying with his parents in Beeville, TX. There, he presented at nearby churches. Jacob got to see and catch up with his parents. On November 11th, Roxanna and Alex made the decision to dedicate their daughter, Miracle, to the Lord at Bethel Independent Baptist Church. On November 30th, Bro. Jacob and Mrs. Veldhuis (His mother in-law) planned a teen bonfire.They had hot dogs, chips, water, and roasted marshmallows. Jacob preached on “How To Be Born Again?” The teens listened but did not make a decision about salvation. Please keep them in your prayers. In December, Jacob presented at 3 churches. Two churches were located in California and one church was in Arizona. Jacob and Lydia got to spend more time together and help out at their church (Cocopah Bethel Independent Baptist Church) in Yuma, AZ. On December 8th, they had an all church Christmas bake day. It went well and they had a good turn out. Mrs Veldhuis told a story on Jesus’ birth. Pastor Veldhuis, Jacob, and a few church members helped pick fruit. They put about 15 pieces of fruit in each bag with a little bit of candy and a Gospel tract. The church handed out these bags on the reservation. Churches are not allowed to door knock but they are allowed to give out free bags of fruit. All throughout the month, Jacob and Lydia went through discipleship with a couple of teens and adults. On the 31st, the church had a New Years celebration. This celebration included preaching, fireworks, games, and food. We had a fun time! During the month of January, Jacob traveled throughout California presenting their ministry. He was able to present at 6 churches during that month! He had a wonderful time presenting and fellowshipping with pastors and others! For the next few months, Jacob and Lydia will be living at the Ronald McDonald Home in Phoenix so that her doctors can keep a closer watch over Lydia and little Samuel. Lydia’s lung function has remained stable, although her pulmonary pressure has a higher risk of increasing as the pregnancy progresses. Please pray for God’s protection for she and Samuel as she has been experiencing some preterm contractions. Thankfully, they were able to be stopped each time before they progressed into labor. Health: Lydia, Baby Samuel, Sherry with possible tumor; Mary, Edward, and Bro. and Mrs. Veldhuis with general health. On July 29th, we started full time deputation. We have traveled over 15,000 miles on the road. As of now, we are at 48% of our support goal. These past few months have not been easy. Traveling 15,000 miles, dealing with car repairs, my father in-law’s cancer, and Lydia’s pregnancy complications with baby Samuel on the way are some of the trials we have faced. Despite all of this, God has been good to us. He has helped us emotionally, physically, and financially these past few months. We want to thank you all for prayers for my family as well as those of you who send your monthly support. Continue to pray for us as we try to wrap things up on deputation. We are trusting that God will provide enough funds for us to stop deputation July 1st of this year. Please consider helping us reach our goal financially! One of our main goals is to begin a couples class at Bethel Independent Baptist Church. Another is to start the H.O.P.E. addiction ministry. In the future, we also desire to plant a church on the Quechan reservation and establish other ministries as the Lord leads us to start in order to reach Natives for Christ. Please pray that God would begin working in hearts and opening doors in order to allow us to reach these goals. Currently ,there are over 1.6 million Native Americans in the United States and 562 distinct sovereign tribes. Many of these tribes struggle with substance abuse and poverty and have no gospel witness. Please pray with us that God will send more laborers into the Native American field located right in our backyard. That more churches will take us on for support. As of now, we are at 48% of our needed support. That God will provide for a ministry vehicle or the money to purchase one. We are looking into purchasing a $3,500 to $4,000 car. “But if our Gospel be hid, it is hid to them that are lost: in whom the god of this world hath blinded the minds of them which believe not, lest the light of the glorious gospel of Christ, who is the image of God, should shine unto.